Founded by James Boyd in 1796. Established in 1976, the Albany Brewing Company is the first modern brewery to open in the city of Albany. In 1796, a man of Scottish descent by the name of James Boyd opened a brewery on South Ferry Street in Albany, New York. The “Arch Street Brewery”, as it was originally named, holds the honor of being the first modern brewery to open its doors within the city of Albany. 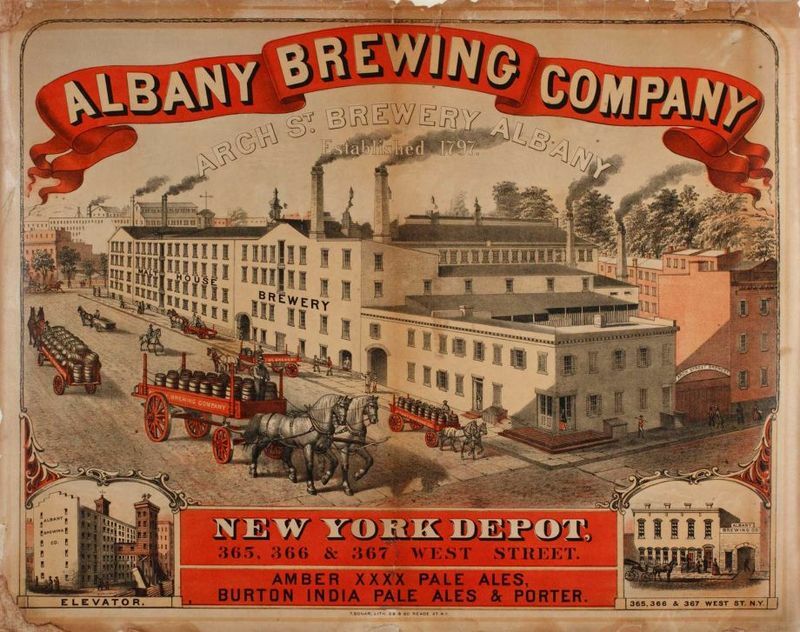 The company would later be renamed the Albany Brewing Company, and within its factory walls is crafted a number of amber pale ales, India pale ales, and porters. James Boyd is also responsible for the construction of many of the brick buildings across the street from the site of the brewery. Additionally, he was an important religious figure in Albany during his lifetime; he served as “a deacon, elder, and trustee of the Albany Presbyterian church” (Flynn, 2007). The church Boyd dedicated his life outside of brewing still stands today and can be found at 362 State Street, Albany NY – it is now named the First Presbyterian Church. Unfortunately, in 1906 after the Albany City Council passed legislation to ban all alcohol sales, the Albany Brewing Company was sold to Kola Neis who owned the Salem Brewery Association. The parent company closed the doors of The Albany Brewing Company for good two years later in 1908. Ryan Scarpelli, “Albany Brewing Company,” Albany Walks for Health, accessed April 20, 2019, http://www.albanywalksforhealth.com/items/show/69. Bielinski, Stefan. “James Boydcolor.” James Boyd. Accessed March 02, 2016. https://www.nysm.nysed.gov/albany/bios/b/jaboyd7389.html.